Even though I loved my 2nd generation iPhone, I'm glad I upgraded. The 3GS is awesome and I'm very impressed with the video quality. I'll be playing with the phone over the weekend so you might get some most post on my reviews. Have you noticed your iPhone battery doesn't last too long? 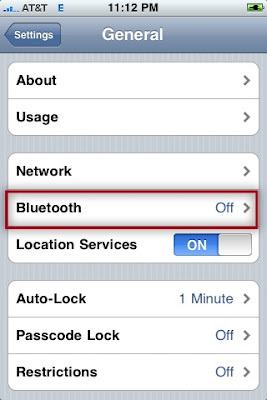 One quick thing you can do to extend the battery life is to turn off Bluetooth. If you're not using a hands free kit, then you don't need to have Bluetooth turned on. 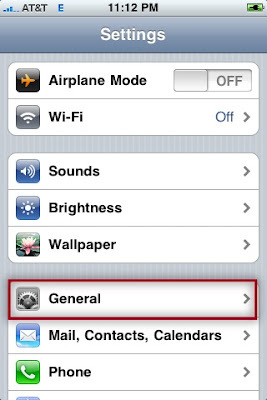 To turn it off go to Settings and General. Tab Bluetooth and slide the button to OFF. Have you ever been surfing the Internet on your iPhone and stumble across a website you know one of your friends would like? No problem, by pressing the plus sign (+) at the bottom of your Safari page and then tapping the Mail Link to this page you can share an e-mail link. 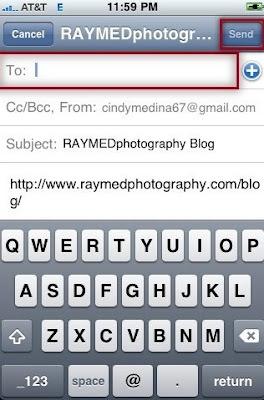 This will automatically start an e-mail in your default e-mail inbox, pre-populate the Subject line with the site name (depends on how the site is set up) and it will add the link in the body of the e-mail. 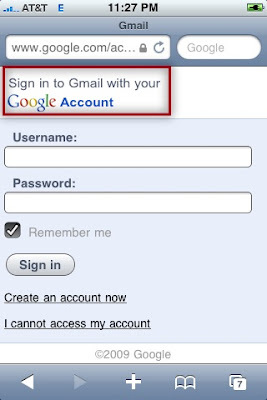 All you have to do is basically enter the recipient's e-mail address (s) and press Send. You can also add a message in the body of the e-mail but that's optional. Here is another great service that allows you share more than just text and pictures on Twitter. With Tweetube you can also share webcam videos, YouTube videos and website URLs on Twitter and all for free. 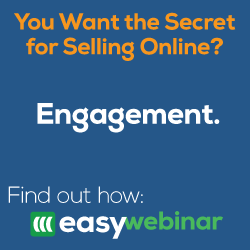 So sit back and play our video to learn how this service works. Have you used this service? Or what service do you use and why? 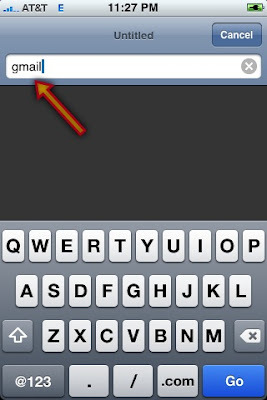 Your iPhone is so smart that it will direct you to http://www.gmail.com/. When you need to visit a .edu, .org or .net site you can press down the .com key and it will display these other options which will avoid some extra keystrokes. Do you have some tips you want to share? I know one of the coolest things people first liked about the iPhone is that you swipe your finger on the screen to do numerous functions. One of the times you swipe is to scroll through the different pages of applications you have and if you're like me you probably have lots of them. Well here is a quick tip on another way of scrolling through your pages, just tap anywhere on the line of dots that indicate you have multiple pages. BTW, this works when scrolling through different pages of Safari and where ever you see the lines of dots. 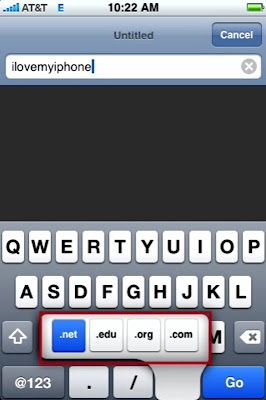 As you've probably heard or seen already with the upgrade to 3.0 you can now search across your iPhone. A search page has been added to your iPhone and to view it you can swipe your screen to the right, it's the first page on your iPhone. You can also get to it by tapping on the line of dotts. The new search page is indicated by a magnifying glass to the left of the line of dotts. 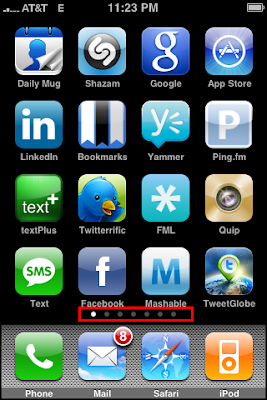 Or you can press Home to toggle from and to your first app page to the search page. Do you have a quick tip to share?